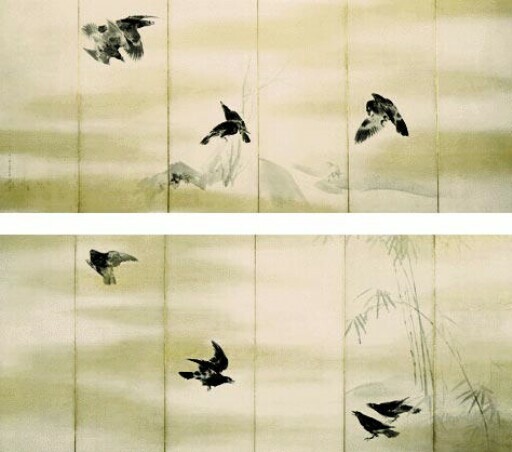 In these screens, a clump of young bamboo and a gnarled plum tree beside a stream provide the setting for a group of crows in flight and at rest. Soft washes of gray ink and gold convey the feeling of dense fog and evoke a sense of deep space. Nine birds are boldly rendered in thick, textured brushstrokes in varying tones of gray and black, achieved by laying down the ink with the side of the brush. Painted when Okyo was thirty-three years old, these screens demonstrate a free ink style that is rarely found in works of his youth. However, the startling realism of these cawing birds, and the detailed observation of natural form, are characteristic of Okyo’s style.